Deprogramming A Bully: The Barber Chair series ~ Book 1 is a Christian fantasy fiction novel for young adults and preteens written by Kathy Rae. Boone Butterfinkle was not having the best of days. The fourteen-year-old had been suspended from school after he was found to have locked a fellow classmate in a storage room during a dance. He had done a few other things as well that hadn’t caught up with him yet. Boone’s problems all seemed to stem from the fact that his father’s job had been keeping him away from home a lot lately, and Boone felt abandoned by him. He began to act up and pick on kids who were smaller than he was. Things got even worse when he was assigned to work on a science class project with the class geek, Brianne Wachtler. Brianne wore big pink glasses, never cared for her hair and seemed completely clueless, but the project she was proposing they do together, measuring the gases emitted by different vegetables, sounded interesting. Brianne invited him to her house to help pick the fresh peas they would use. When he saw her, Boone was stunned by her transformation. She was wearing contact lenses, and her blonde hair was beautifully groomed. Boone decided she would go out with him, and he was going to do everything he could to make that happen -- even if he did have to be a bully along the way. 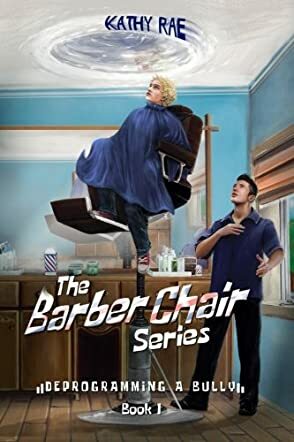 Kathy Rae’s Christian fantasy fiction novel for young adults and preteens, Deprogramming A Bully: The Barber Chair series ~ Book 1, is a dark and cautionary tale about divine intervention and the dehumanizing place Boone finds himself in after he sits in a barber chair for a haircut. I cringed as I read of these young kids who all had family difficulties and ended up in a harsh prison where they were turned, piece by piece into cyborgs. While those terrified children quickly learned the lesson of how their behavior terrified their own victims, the institutional violence in this story seemed a bit too stark and nightmarish for my taste. On the plus side, I enjoyed seeing how the captive children learned to work together, to form a cohesive team and strategy for surviving their ordeal. At times, the story became a fast-paced action tale that had its moments of suspense, and it is well-written with authentic and believable characters. Deprogramming A Bully: The Barber Chair series ~ Book 1 is recommended for children who enjoy action and adventure Christian fantasy with the proviso that their parents read the book first to ensure its suitability for their family members.